Jon Steven "Steve" Young (born October 11, 1961, in Salt Lake City, Utah) is a former American football quarterback, best known for his time with the NFL's San Francisco 49ers. He also played for the NFL's Tampa Bay Buccaneers and the Los Angeles Express of the United States Football League. Young was named the Most Valuable Player of the NFL in 1992 and 1994, the MVP of Super Bowl XXIX, and was inducted into the Pro Football Hall of Fame in 2005 – the first left-handed quarterback to be so honored. He holds the NFL record for highest career passer rating and won six NFL passing titles. Quarterback Steve Young entered the National Football League through the 1984 supplemental draft. After spending two seasons in the ill-fated United States Football League, the consensus All-America from Brigham Young was selected by the Tampa Bay Buccaneers in first round of the special draft. In 1987, Young was traded to the San Francisco 49ers where he served as the backup to Hall of Famer Joe Montana. After seeing limited action in his first four seasons with the 49ers, Young stepped into the starting role in 1991 after Montana suffered an injury. Young wasted little time in taking command of the 49ers offense. Despite a knee injury that forced him out of five games that season, Young passed for 2,517 yards and 17 touchdowns to post a league high 101.8 passer rating – the first of four straight passing titles. 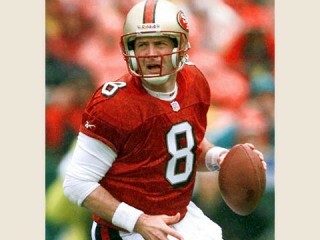 Young added two more passing titles in 1996 and 1997 to tie him with the legendary Sammy Baugh as the only quarterbacks in history to win six NFL passing crowns. His finest season came in 1994 when he posted a then-record 112.8 passer rating by completing 324 of 461 passes for 3,969 yards and 35 touchdowns. Young also added seven rushing touchdowns as he guided the 49ers to a NFC West title with a 13-3 record. The team then coasted through the post-season. In the NFC championship game that year, Young threw two touchdowns and rushed for one as the 49ers downed the Dallas Cowboys 38-28. He topped off the year with an incredible performance in San Francisco 's 49-26 win over the San Diego Chargers in Super Bowl XXIX. Young passed for 325 yards and threw a Super Bowl record six touchdowns. He also was the game's leading rusher with 49 yards on five carries. For his efforts, he was named the Super Bowl Most Valuable Player. During his NFL career, the left-hander threw for 3,000 or more yards six times and had 20 or more touchdown passes in a season five times, and posted a passer rating of 100 or higher six times. Aside from his passing ability, Young was a constant threat as a runner. He ran for 4,239 yards and scored 43 rushing touchdowns. Young, one of the most accurate passers in league history, was named All-Pro in 1992, 1993, 1994, and 1998 and earned All-NFC honors three times. The two-time league MVP also was selected to the Pro Bowl seven times. View the full website biography of Steve Young.